Canon i-Sensys MF724CDW Driver Download. Canon i-SENSYS A4 color laser MFP MF724CDW scan copy print and fax. Compact A4 color laser multifunction system tailored for small businesses and mobile users. The perfect introduction to the class of compact multifunction systems with full functionality. This A4 color laser multifunction systems requires only a small footprint. The variety of intelligent scanning, printing and connectivity options for improved efficiency. It provides features that are normally only found in larger systems, so the i-SENSYS MF724Cdw is the first choice for small businesses and home offices. 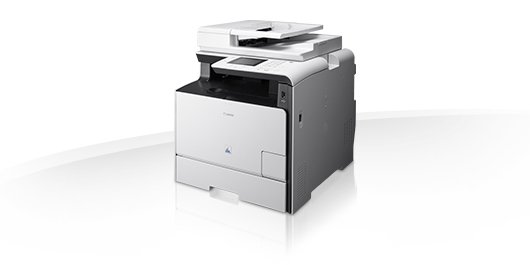 The A4 multifunction laser offers the quality and reliability of Canon for worry-free printing, scanning and copying. Fast warm-up times, duplex printing and scanning with 20 pages per minute and 50 pages summary document feeder ensure the execution of the daily office routine without effort. Simply great results printer. Always use the full potential of MF724Cdw, thanks to its 8.9 cm color touch panel that provides access to all the powerful features, easy. Just as easily, it must be maintained consistently high quality: If you change the All-in-One Cartridge Canon all major components are replaced at once, for you, this means fewer parts to which one must take care. For the mobile workforce use. The MF724Cdw offers the always same intuitive interface, whether on laptops, the tablet or the smartphone - regardless of whether they are in the office or on the road. Full support for iOS, Android, Google Cloud Print and WLAN mean total freedom to work how and where you want. The free Canon PRINT business app (for iOS and Android) makes these functions available within and outside the office. And do not worry at confidential documents, the Secure Print feature protects your print jobs by a PIN code. Distribute scan and print via the cloud. The quick, detailed scanning capabilities fit seamlessly into the series of cloud-based storage options, functions to share and print options. In this way you and your colleagues can share documents with each other, at any time, any place and on any device. You can from MF724Cdw not only on your PC by using the MF-scan function or via your mobile device using the PRINT Canon Business app to scan, but also directly to email addresses, network folders or USB storage media. Very smart Intelligent Network capabilities. The integration of MF724Cdw in an IT network is done quickly thanks to the support for PCL5c / 6 and Adobe PostScript. The IT can effectively monitor a web-based remote maintenance interface the system, manage, maintain and upgrade without being on site - a valuable time saver. The compatibility with the e-Maintenance service platform Canon means that the MF724Cdw can be seamlessly integrated into a Canon MPS or a printer fleet. A whole series of energy-saving features reduce the total cost of ownership and is good for the environment.